New users at 888Sport will have enhanced odds for the Wolverhampton vs Man Utd match. All you need to do is to register, make a deposit with the bonus code (888ODDS), and bet on Wolves (22/1) or the Red Devils (10/1) to win. New users at 888Sport can now bet on Wolverhampton - Manchester United with enhanced odds! It’s really enjoyable to watch Solskjaer’s new Manchester United. However, this time it could be beneficial as well. 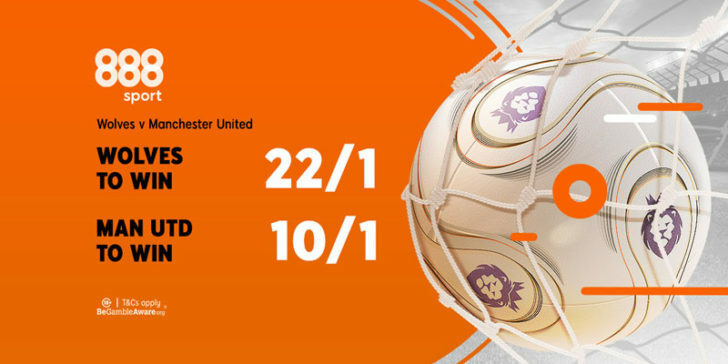 If you join 888Sport now, you can enjoy the enhanced odds for Wolverhampton vs Man Utd! All you need to do is click here, register and make a deposit with the 888ODDS promo code. Easy! Manchester United have won 11 of their 14 league games under Ole Gunnar Solskjaer. With a record like that, bookies don’t pay you too much after a successful bet on the Red Devils. However, thanks to 888Sport’s enhanced odds for Wolverhampton vs Man United, it could be really profitable to bet on Ole’s Red Army now. Their 10/1 odds are much higher than the industry average. Same goes for Wolves (22/1) who have actually beaten United in the FA Cup this season. We predict an exciting game, so choose wisely and enjoy the benefits of 888Sport!